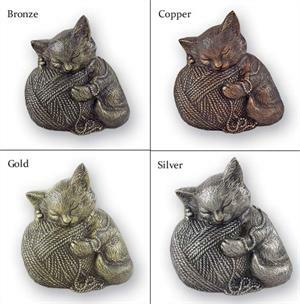 Precious Kitty is a beautifully made solid metal cremation urn designed specifically for felines. This artistic quality urn will honor the memory of your precious cat and is available in the four popular finishes of bronze, silver, gold and copper antique. Made from solid aluminum, these urns go through several steps of labor intensive finishing to create a truly wonderful cremation memorial. Your pet’s ashes are installed through a bottom opening secured tightly with a round tamper resistant plastic closure.